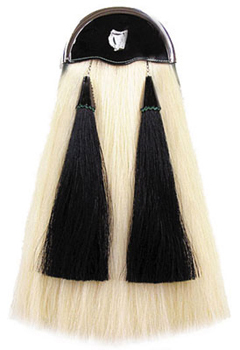 This Irish sporran has a white horsehair body and black horsehair tassels. 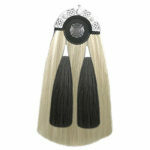 The cantle is 6″ smooth chrome with a black patent leather targe. The center piece is a chrome Irish harp. 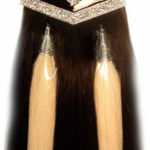 The tassel cones are chrome and have a green leather liner.